It never seems enough to pay less and earn more with EasyParcel. October bash is here! Be sure to top up any new package from 1st October 2018, so you can get great savings on your shipment up to 5kg with Pgeon Delivery at RM5 nett this whole October. The best part is, you can choose send to and from either at your doorstep or selected Pgeon Points. Hurry up, earn now with a new top up from as low as EP100 and book Pgeon Delivery to send from Penang, Johor and Selangor to the whole Peninsular Malaysia at RM5 flat-rate till 31st October 2018, for unlimited instead! Learn more about this promotion and Register to Get RM 25 right now! This promotion is applicable for the new top-up from 1st till 31st October 2018. This promotion is available for shipments to send from Johor, Penang, and Selangor only, but deliver to the whole Peninsular Malaysia. The RM5 flat-rate is applicable for Pgeon Delivery parcels made within 1st to 31st October 2018. EasyParcel reserves the right to cancel, terminate or suspend the promotion. EasyParcel reserves the right to amend any of the above terms & conditions from time to time without prior notice. 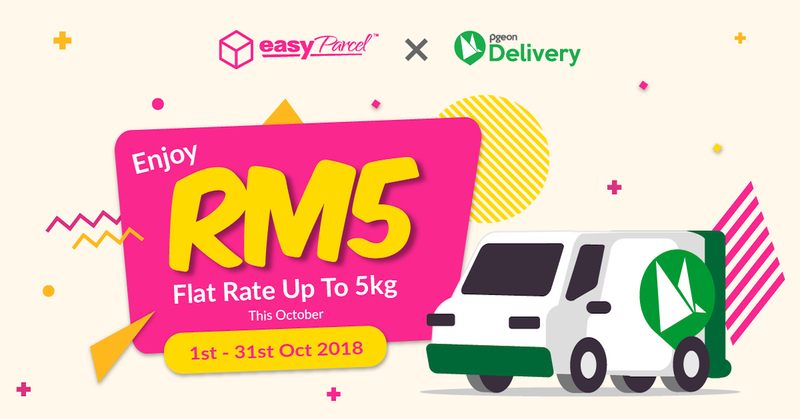 Kindly refer to this https://www.easyparcel.my/blog/promotions/rm5-flat-rate-pgeon-delivery-october-2018/ on EasyParcel website.